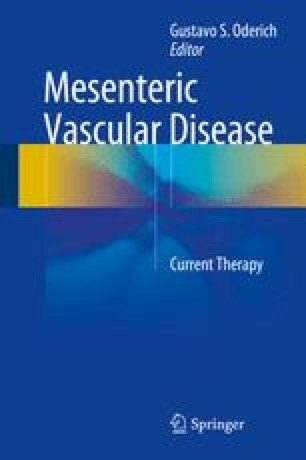 The syndrome of celiac artery compression by the median arcuate ligament (MAL) or possibly by fibrotic celiac ganglion was first described by Harjola in 1963 and then by Dumbar et al. in 1965. Symptoms may vary from postprandial abdominal pain, similar to that seen with chronic mesenteric ischemia, to pain with exercise, nausea, vomiting, or weight loss. Diagnosis may be confounded by a vague and variable clinical presentation, as well as by the fact that celiac compression by the ganglion is a normal variant noted on imaging in asymptomatic patients. In fact, extrinsic compression of the celiac artery may be found in 20–70 % of individuals undergoing imaging for possible abdominal disease. Sari S, Verim S, Sivrioglu AK. Bozlar U: A rare cause of secondary hypertension: median arcuate ligament compression of the renal artery diagnosed by CT angiography. BMJ Case Rep. 2013 Jun 3;2013. pii: bcr2013009937. doi: 10.1136/bcr-2013-009937.